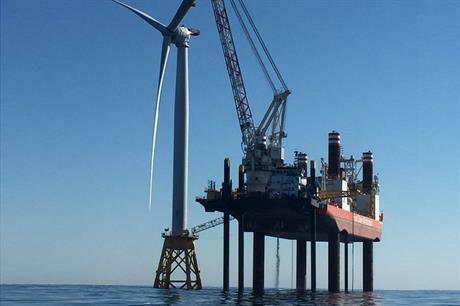 UNITED STATES: America's first commercial offshore wind turbine has been installed at Deepwater Wind's 30MW Block Island project. Installation of the first 6MW GE Haliade turbine was completed at 08.30 local time (13:30 UK time), according to Deepwater Wind CEO Jeff Grybowski. The nacelles were shipped from GE's Saint-Nazaire facility last month and arrived in Rhode Island, northeast US on 1 August. A total of five turbines will be installed 26km off the US mainland by Fred Olsen Windcarrier's Brave Tern jack-up vessel. The jacket foundations were installed over the summer of 2015. The project will provide electricity to more than 1,000 inhabitants of the 25-square-kilometre Block Island, which currently ferries in a million gallons (4.5 million litres) a year of pricey, dirty diesel. Offshore wind is beginning to gather pace in the US. The Bureau of Ocean Management has auctioned approximately nine zones for offshore wind development, with a tenth off the coast of New York expected before the end of 2016. At the start of August, nearby Massachusetts passed a bill requiring local utilities to buy power from up to 1.6GW of offshore wind by July 2027.